On a new "Becoming a Healing Presence," Dr. Albert Rossi, a professor of theology at St. Vladimir's Seminary, explains that when we are intentional in our listening and silence, we are in the best position to commune with Christ. “Sweeter Than Honey” Is Back! Dr. Peter Bouteneff, a professor of theology at St. Vladimir's Theological Seminary, returns with his podcast "Sweeter Than Honey: Orthodox Christian Theology and Life as Joy and Light." Here he examines the specific phenomenon of Episcopalian converts to the Orthodox Church. "If a righteous man falls down seven times, seven times shall he rise again" (Prov. 24:16). Relapse does occur, but Rita Madden, host of "Food, Faith, and Fasting," reminds us that setting realistic goals can help us avoid succumbing to the passions of overeating and slothfulness. On a new "Frederica Here and Now," Frederica Mathewes-Green, author of the Conciliar Press book At the Corner of East and Now: A Modern Life in Ancient Christian Orthodoxy, questions the wisdom of giving to the poor "no questions asked." Halloween . . . Again? What's an Orthodox Christian to do on Halloween? Fr. Joseph Huneycutt, priest at St. Joseph Orthodox Church in Houston, Texas, and the author of the Conciliar Press book We Came, We Saw, We Converted, explains his position on All Hallow's Eve. Headed to Seattle? Fr. John Pierce, a local coordinator from Tacoma, Washington, discusses some of the practical aspects of attending the All-American Council of the Orthodox Church in America. Curious how things are going at the first ever Orthodox college of the liberal arts and sciences? Bobby Maddex interviews Dr. Frank Papatheofanis, President of St. Katherine College, about this new institution's inaugural semester. Bobby Maddex interviews Fr. Justin Matthews, the executive director of FOCUS North America, and Theodora Polamalu, a FOCUS advisory board member and the wife of Troy Polamalu, strong safety for the Pittsburgh Steelers, about FOCUS's new "Tackle Poverty" campaign. 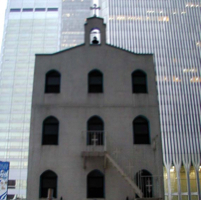 On Friday, October 14, The Greek Orthodox Archdiocese of America announced an agreement with the Port Authority of New York and New Jersey regarding the rebuilding of St. Nicholas Greek Orthodox Church, which was destroyed in the terrorist attacks of September 11, 2001. John Maddex talks with Fr. Mark Arey about that agreement and where we go from here. Fr. Richard Rene, priest at St. Aidan Orthodox Church in Cranbrook, British Columbia, introduces us to the world of Mysterion, where his young adult fantasy series takes place. The newest book in the series, The Edge of Mysterion, was just published by Conciliar Press. Dn. Michael Hyatt continues his series on the Conciliar Press book Spread the Word by Fr. Michael Keiser. Here he details the three ways in which the Early Church demonstrated its emphasis on evangelism.